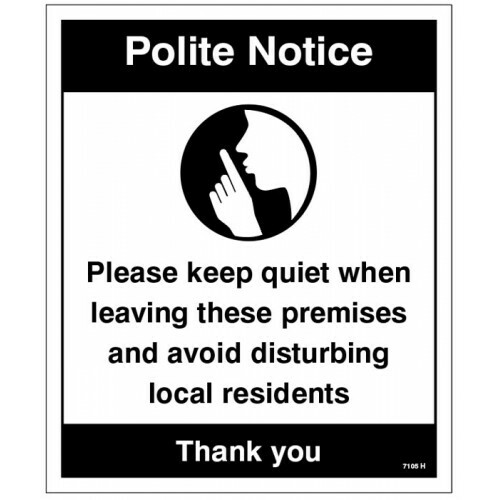 Polite notice Please keep quiet when leaving? Advise visitors or residents to bars or hotels of the rules and regulations of the premises. Tags: 17105H, 27105H, bar, sign, hotel, sign, alcohol, sign, car, park, sign, age, verification, Polite, notice, Please, keep, quiet, when, leaving? Advise visitors or residents to bars or hotels of the rules and regulations of the premises. Material Options Explained Below is a more detailed description of the materials this particular safety si.. Drugs The use - possession or distribution of drugs is strictly prohibited? Highly reflective (Class R2) traffic sign to help encourage drivers to slow to an appropriate speed in areas that children may be playing. Manufactured on a 3mm aluminium composite material which is .. Warning abusive language or threatening behaviour will not be tolerated?